Have I mentioned how much I love Bright Paper Packages? 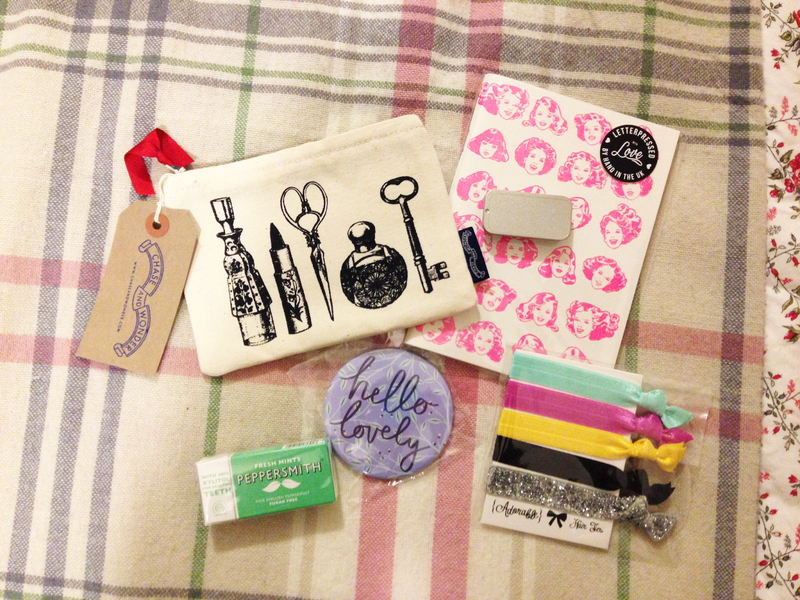 The theme of February's box was 'Handbag Must Haves', which I found pleasantly surprising as I largely expected something Valentine's related. I was also pleasantly surprised by how essential I did actually find all of these things, many of them being items I was actively looking for myself to use on a daily basis. As always, Bright Paper Packages have chosen some wonderful arty brands to supply products from, with some gorgeous screen printing seen here from Chase and Wonder, a Cheshire company working out of a converted cowshed! This small canvas purse immediately replaced my regular purse, allowing me to pop all of my cards, coins, and receipts in one place. My cards are banded together by type, and so far I've found it a lot easier to navigate than a traditional purse, oddly. Plus it takes up a lot less room in my bag. You should certainly take a look at the stationary they have on their website; I've been won over by their 'aristocratic dogs' wrapping paper. 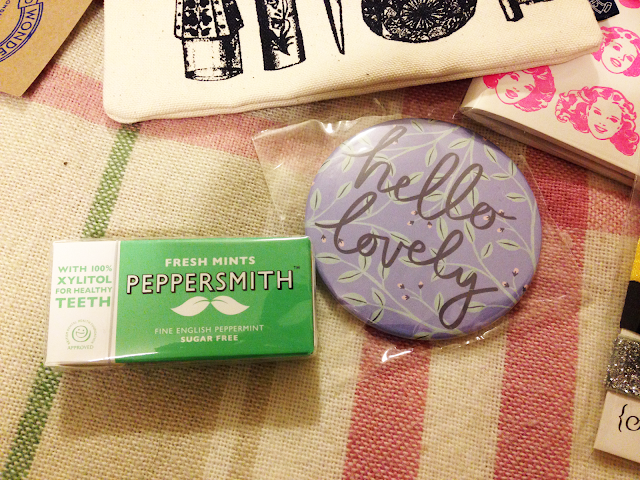 Alongside the fabulous purse was a pack of Peppersmith mints, which I've seen around in supermarkets before, and this purple floral mirror from Hutch & Willow. I've never been one to carry around a mirror in my bag before, but as of late I have actually been on the hunt for a nice one, so this was a very welcome surprise. It fits comfortably in the palm of my hand, and I keep it in my new purse to keep it clean. A note on the mints: the greatest mints I've ever tasted. They're sugar free, sweetened with xylitol, and really, really packs a minty punch. Definitely my new mint of choice. Cue my excitement when I finally got my hands on some elasticated ribbon hair tyes. Supposedly they're better for your hair as they don't snag as much as traditional bands, and the bonus is that these ones from Adorable Things are just...adorable. I keep the black and mint green ones on my wrist most days; they do double-up as a cute accessory next to my watch. Admittedly I may never use the silver glitter one, so it'll probably be passed on to my little sister as she is the accessory queen at age seven. 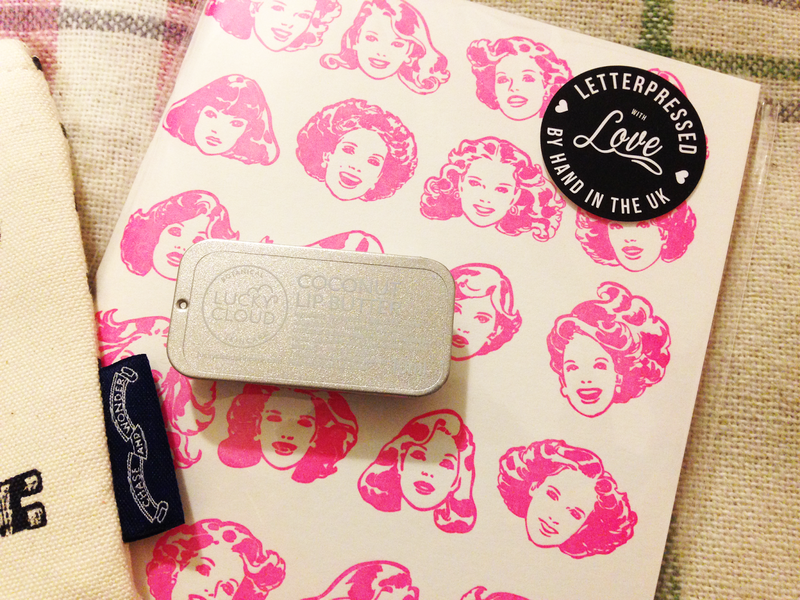 Last but certainly not least are a letterpress notebook from 1973 and a small tin of coconut lip butter from Lucky Cloud. 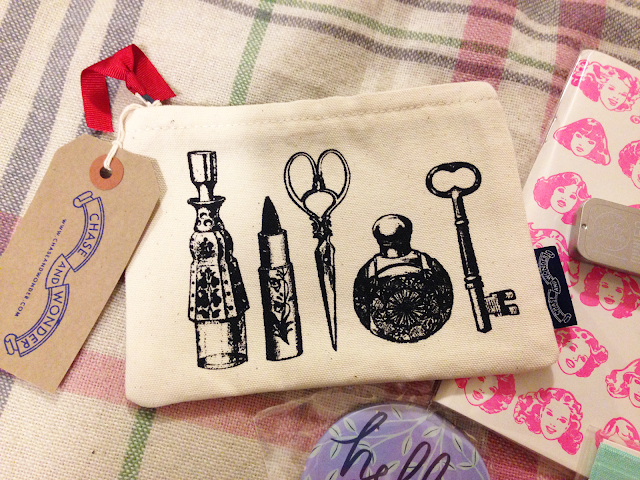 My bag is never complete without a notebook and a lip balm, so they've hit the nail right on the head with these. I adore anything coconut scented, so this vegan product is ideal. After browsing their website I can confirm I'll be shopping with them in the near future, as their packaging is gorgeous and all of their skincare is natural and homemade. And look at the design on that notebook! It's absolutely delightful, and very Barbie. Bright Paper Packages have outdone themselves yet again; I can't wait to see what they bring next month as they return to regular-sized boxes rather than letterbox-sized! For £20 a month, I think this subscription service is ridiculously well-priced and great value for money. So far in the past three months there have only been one or two things that I haven't had a use for, and they get passed straight along to friends and family, so we're all winners.